But you could afford to go FI?? Lol on a side note, I'm still hoping to get up to 'stoon sometime to check out this setup of yours. I'm generally up there during the week for work - Possibly meet up before winter? Last edited by TeamRX8; 10-06-2011 at 07:47 PM. Haha as for the Dollars to go FI I was lucky enough to have a wicked, but no life, shift working summer job which payed hella good dollars for 2 summers. That was a while back and didn't get hired back after the first 2 years because I wanted to take too much time off.... Thats how she goes I guess. I'm cool with meeting up before winter, if you're gonna be up here you'll have to shoot me a PM. This is very informative, but I have an issue, I replaced my pulley with the AP Pulley, and afterwards my CEL started blinking, when I went to find out the code it said it was a misfire, but I'm not actually getting misfires at all, I will try to reset the NVRAM but if that doesn't work can anyone give me some advise? Second you need to do an ESS reset. You can search those two words and find out what it is and why. Well, lets start at the beginning, and see which steps you have checked, and which ones you haven't. First off, you need a clean air filter. Having a clogged one doesn't do you any favors. Next, you need a clean, fully functional MAF sensor. The computer needs to know how much air is coming in in order to determine how much fuel to inject. Next, your throttle body needs to be clean, and not sticking. Once it's past that point, it goes past all the valves in the Intake manifold, like the SSV. Those need to be opening and closing smoothly, and the solenoids that control them, need to be working properly. Now the air mixes with the fuel, as the injectors spray into the intake manifold. All the injectors (6 for Series 1, 4 for Series 2) need to be functioning properly. Finally, the air fuel mixture gets sucked into the combustion chamber. If the compression is weak, or there's too much carbon built up, you're not going to get enough mixture sucked into the combustion chamber. Then the rotor compresses the mixture, and it aligns up for an Ignition firing event. Again, if the compression is weak, when the ignition event happens, the combustion forces are going to escape out of the combustion chamber, leading to a loss of power. On that same note, if the ignition system is weak, that combustion event isn't going to take place, leading to no power being generated. So now the combustion has happened, the rotor has turned, and the exhaust is exiting through the exhaust system. If your catalytic convertor or muffler are plugged up, the exhaust has no where to go, choking the engine to death, preventing the combustion chamber from being empty enough to allow it to get filled with a fresh air fuel mixture charge the next time it crosses on the intake port openings. Also in the exhaust system are O2 sensors, that measure how much Oxygen is in the air, allowing the computer to fine tune the mixture even more. If these are dead, or carboned over, then the ECU can't get the information it needs to give you the best performance. So, let us know which parts of that system you have tested, replaced, and taken care of. Ok guys I got one for you. I got my 8 bout a year ago and desired to change the plug and wires cuz of a misfire and the person that had it before me put both leading plugs on the second rotor and the trailing on the first. When I went to change them I noticed the block was stamped with a t and l. I have searched and searched on the forum and everywhere I look both leading are on the bottom and trailing on top BUT the stamped t&l are rotor 1 leading on bottom trailing on top and rotor 2 is the opposite. I'm still getting a misfire at high rpms. I need to know if I am wrong bout the pos of the stamps and should I put the leading on bottom and trailing on top like I have seen in the forum??? Thx guys for ur help. That's pretty odd and rare! If you compare both the leading and the trailing, one is shorter than the other. It's hard to imagine if the longer plug is sticking far into the chamber. I would follow the position as quoted below. By the way, have you replaced the coils and/or the wires? Run your wires per the above layout (in bold letters). Search for any other help. Last edited by Grace_Excel; 06-26-2012 at 02:24 PM. Worked through all of the great recommended items and appreciate everyones inputs. I found in my case was a failing spark plug on the lead position of the rear rotor. Symptoms were codes at 6000+ rpm and rough idle. I swapped all the coils with plug wires around to different rotors and lead/trail port positions. The issue remained with P0302. 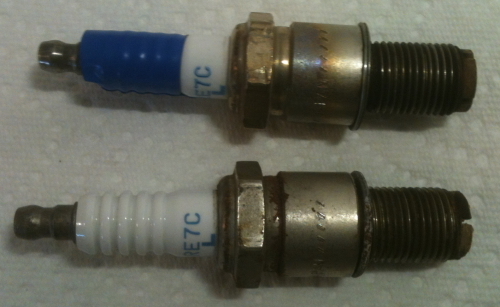 Pulled the plugs and found the body for the lead plug on the second rotor showing discoloration due to heat. I had the previous set of plugs after routine maintenance to compare ohm readings. I found the average 'known good' plugs measured around 4k ohms. The questionable plug measured 2.4 megohms, 6 times of the others. Put in an old one and now runs smoother without throwing a code. Hope others have as easy a fix. Just giving the thread a quick bump. If anyone had any other information that you believe should be put into the op let me know and I will be sure to add it in. Haven't really continuously been updating it as I would like to be. this thread is great, wsh i had found it weeks ago i have been posting on this issue and no ones has been helpful. I have an 04 which i picked up in limp mode, turned out the MOP was shot so i replaced that since then and still now it runs well no loss of power but i have a misfire. It switches between codes sometimes random miss other its 1 or 2 and it has a slight lul in power between 4 and 5k rpm. I have changed maf coz it throw up codes, changed coils and plugs and leads, changed cat and o2 sensors. I have now noticed oil in my accordian i manually moved the ssv switch and it doesnt appear stuck and i now have a code saying lean condition post CAT. to save me some work hours could anyone tell me where i should go to from here? Also the engine was new when i picked the car up, a garage replaced it as to old engine was mixing water, and then it never ran again after until now. People have tried to help without any flaming. He won't go and get a compression test and he has bought a cheap aftermarket catalytic. Geee I wonder why you have a rear O2 cell. He doesn't answer all your questions and if do get anything from him you have struggle to understand what it is he is trying to tell you. You have asked the same questions that are already answered in the thread, the cat was not a cheap aftermarket it was £450 stainless steel cat. mind you regardless of the quality of the cat once i removed the old one and put this one in brand new if the cat was the causing the missifre it would have gone away until the new one failed. I have not had compression done as i would like to iliminate all other issues first as i can do that at home myself and for the compression i would need to go to mazda and if the compression is fine it will be a waste of time and money. where as for free i can eliminate all other issues and make sure everything else is working. otherwise i get low compression replace the engine and not check all other components and end up with a problem again. I have put up two threads and i get same questions over and over which are mainly answered in the op and i am then told to check coils and plugs and cat all after i have said they are new. I like this thread as it is posted someone else who knows what they are doing and is very informative. In my thread i asked what are the possible causes of my problem not exactly what has happend. I answered all your questions mate but you didnt even know what the 2004 231 psi model of and rx8 was? its an rx8 forum thought this would be where people would know that kind of thing? feel free to read my thread and see that the people who have actually helped and given advice i have taken it and reported back the result the people who have asked questions i have answered them. dont be bitter just because you were unable to help it does not mean i didnt appriciate the effort but i would to get the problem fixed and not sit around waiting for you to ask more questions that are irrelivent to my problem. thanks again for you efforts everyone. please ignore the post by WCS any help would be good and i will always add my findings to the thread for other people to use. Bookmarked!! nice post. exactly what ive been searching for.